Corporate Welfare #infographic ~ Visualistan '+g+"
Imagine you are running a huge corporation. You are considering taking a risky move to expand your business, something like writing mortgages for people who you know on paper won’t be able to pay them back. There’s a good chance you could make a lot of money off the foreclosures, but you could also lose a lot of money if you can’t sell the foreclosure inventory you are suddenly saddles with at values less than what is still owed on those subprime mortgages. You go ahead and do it, knowing full well the Federal government will bail your company out because your company is too big to fail. This is corporate welfare, and it creates an uneven playing field for small businesses to compete. It funds corporate mistakes with taxpayer money. It possibly encourages reckless behavior in the boardroom. 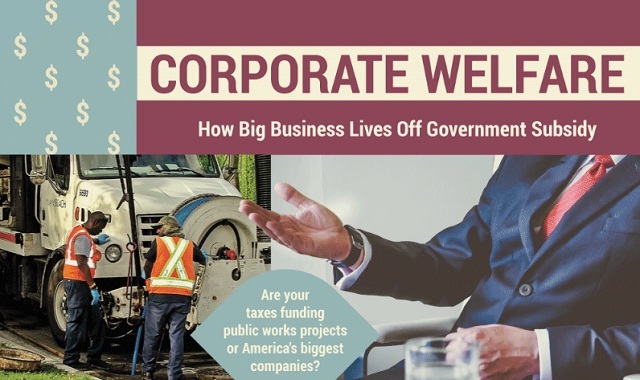 Learn more about the perils of corporate welfare from this infographic!